Silversea Cruises offers sophisticated onboard activities. And it carefully picks the best, most reliable tour operators in each port. Learn more by visiting my Silver Shadow activities page. The Silver Shadow has three full-service restaurants. I describe each on my dining page and list examples of their main entrees on the dinner menu page. 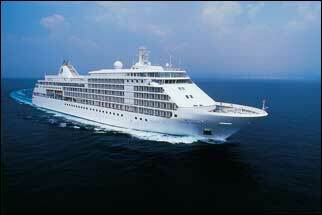 The Silver Shadow has one of the highest crew-to-passenger ratios in the cruise line industry (1.4 to 1). With one exception, I found the crew members to be skilled, friendly and accommodating. If you would like to see what some of the staffers on my cruise look like, click Silver Shadow crew for their photographs. The Silver Shadow is an all-suite cruise ship. Each suite is spacious, stylish, and comfortable. Click suites to see photos of the various suite categories. To illustrate the exquisitely designed public areas, I created public spaces, a photo gallery of 14 different venues. The Silver Shadow and other luxury ships don't have special facilities and programs to entertain mid-teens and children. If you're cruising as a family, you will more likely enjoy an Alaska Cruise if it has age-categorized onboard activities and shore toursfor non-adults. Silver Shadow rates are understandably high because it's a small luxury cruise ship with exceptionally high standards. The Silver Shadow offers great value, if you can afford its cruise rates. If not, don't put off an exciting Alaska cruise. Book one with a less expensive cruise line. Click Silversea Cruises for its website.